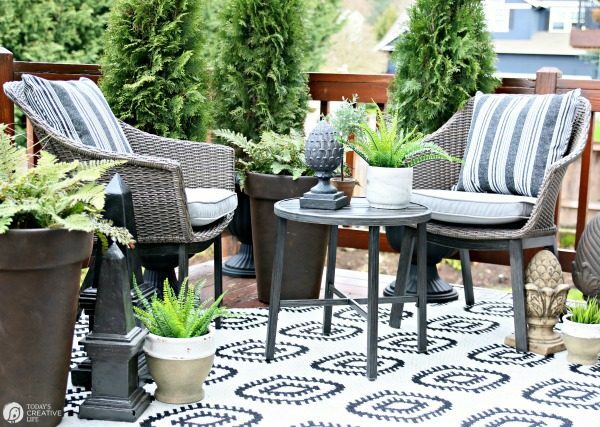 These Patio Decorating Ideas are easy and budget-friendly! 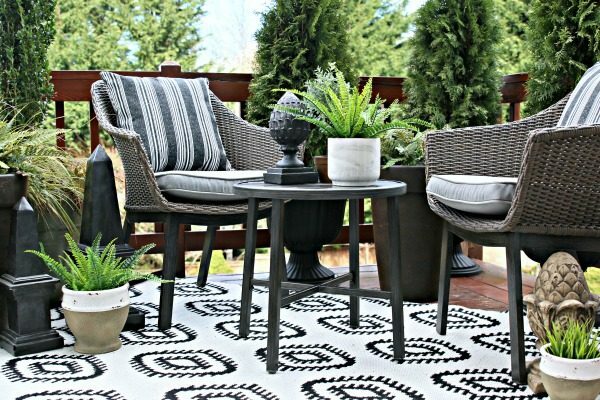 Decorating a patio or deck can be stylish and be done with a limited budget; it doesn’t have to be expensive or difficult! Just like my Easy Spring Porch. 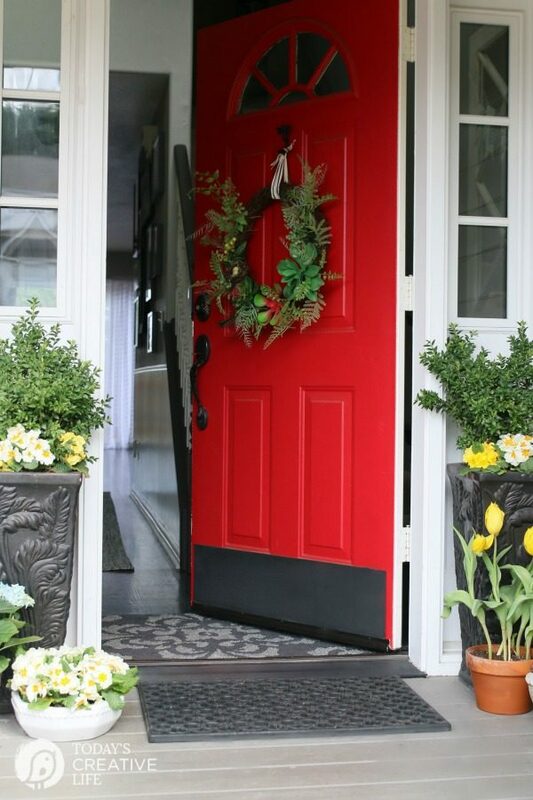 This month as one of the Better Homes & Gardens Live Better Influencers, our focus is decorating our outdoors. 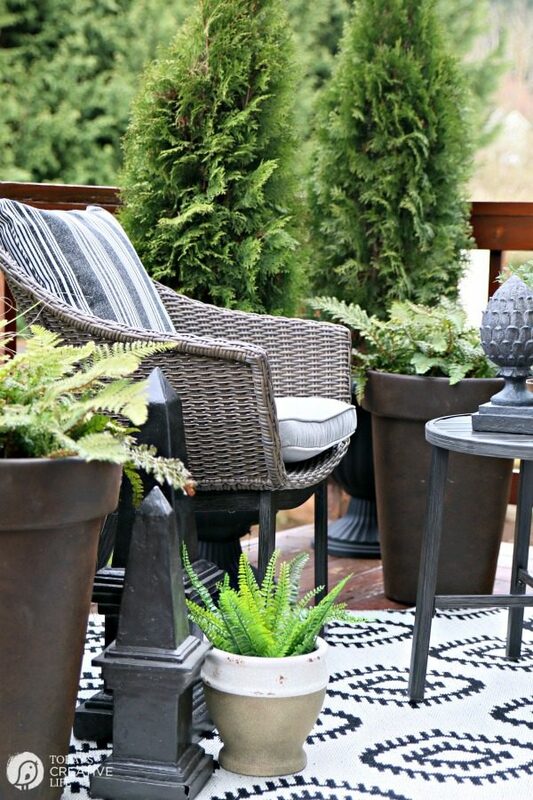 Even though it’s just nearly spring, this is the time to head to Walmart and see all the new Mix & Match patio ideas. Choose your table, choose your chairs, choose your pillows, cushions, and rugs. So many options as well as sets. I love this concept because it allows you to choose what items you want to coordinate. My particular set came all together. 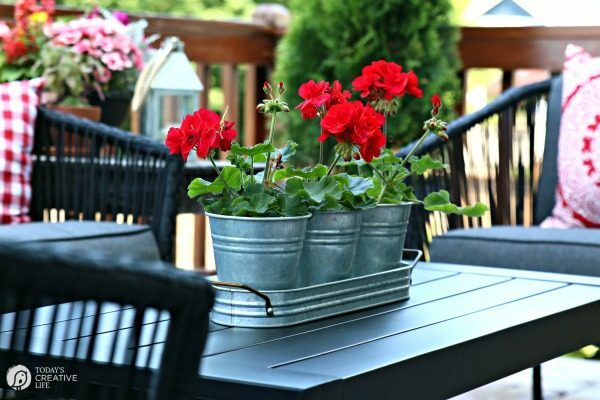 This Bistro Set comes with 2 All-Weather Wicker Chairs, matching seat cushions and the small table. Great for a conversation sitting. I’ve added the rug and striped pillows, and lots of potted greenery. Furniture: Looking at your space, decide on how you want to use it. Do you want to eat outside, do you need extra shade? 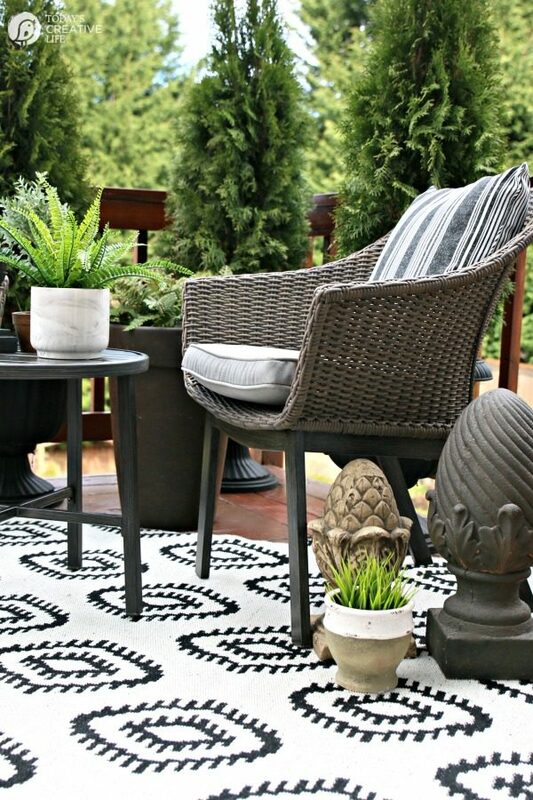 Or do you just want to create a relaxing area to sit back and have a nice conversation and a beverage? Choose something that can be easily updated with different accents when needed. 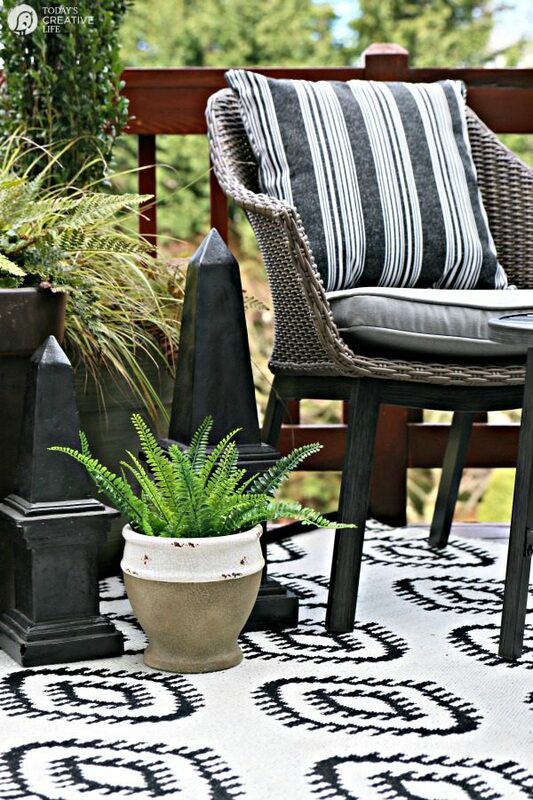 Accents: Using outdoor pillows, rugs, and cushions, you’re able to create a new look whenever needed. 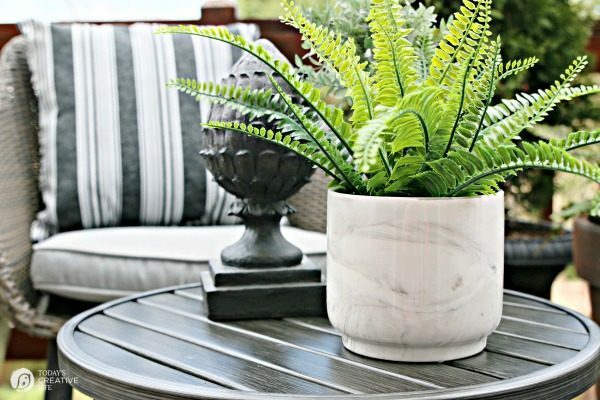 For our patio decorating ideas, I decided on a black, white and green color scheme. I’ll add pops of color later. 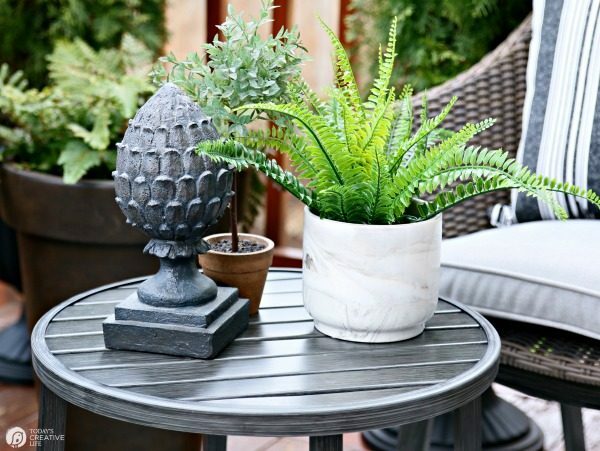 Add garden art accents to compliment the style you want. 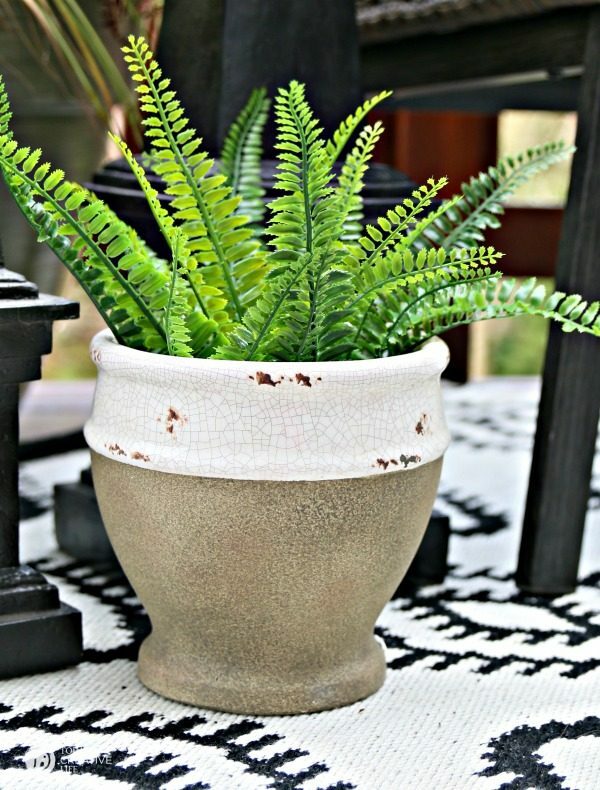 Plants: Choose a planter type and color scheme for both the flowers and pots. I am going for a “French” look with lots of greenery. I’ll add flowers soon. If you go in with a plan, you’ll have a space that flows and looks relaxing. All items listed are from Better Homes & Gardens at Walmart. 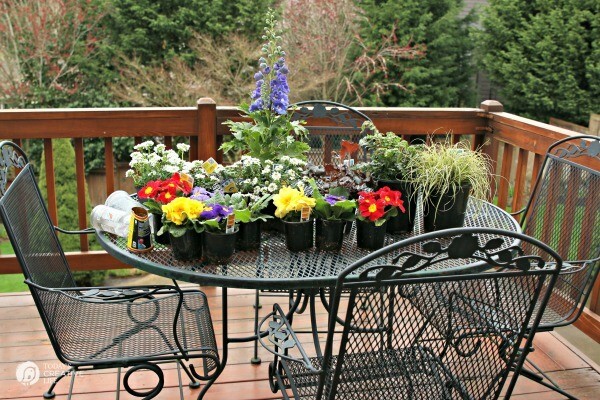 Creating an outdoor oasis doesn’t have to be overwhelming. 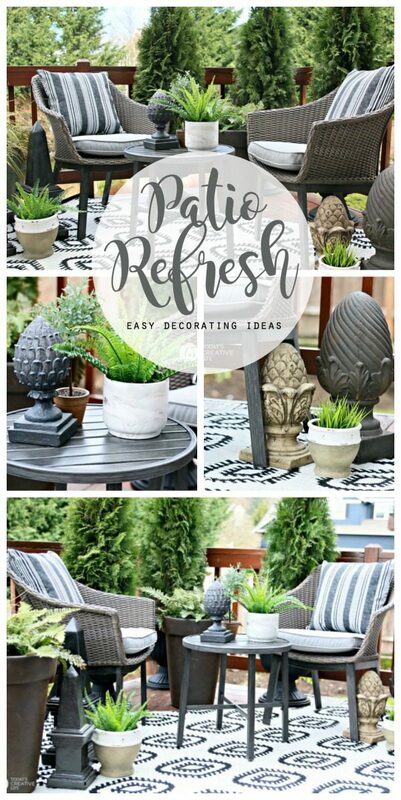 Use my Easy Patio Decorating Ideas and tips to help you create a plan and the space you deserve! Step by step until it’s done! Love all your choices! I got that rug for my front porch after I saw yours! It looks gorgeous!! Love that rug, it really helps to brighten the space! Ok, you rocked this outdoor patio post!!!!! 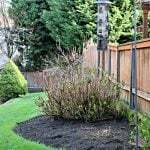 Holy moly, your yard looks amazing! I so want to run out to Walmart and buy everything you bought! 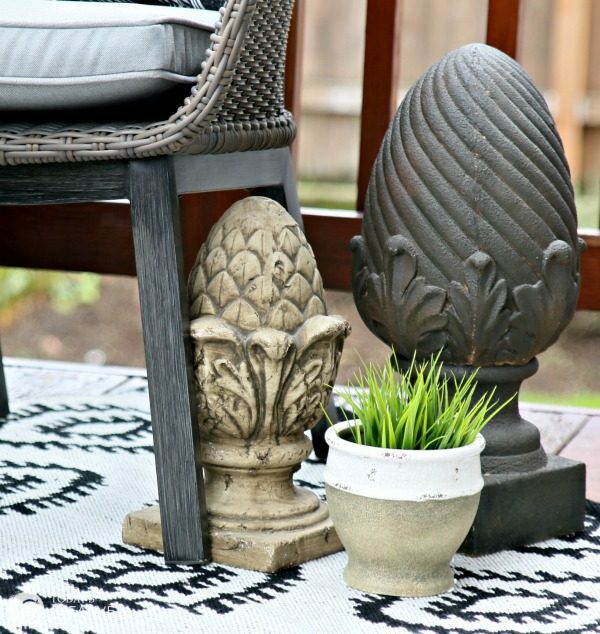 That rug is calling my name this spring. 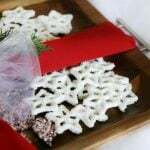 Hey, thanks so much for sharing your post over on our Friday Friends Linky Party. Your the sweetest! Thank you Janine! I can’t wait to be able to set it up for good!